PREP — HALF MAN! HALF BURGER! 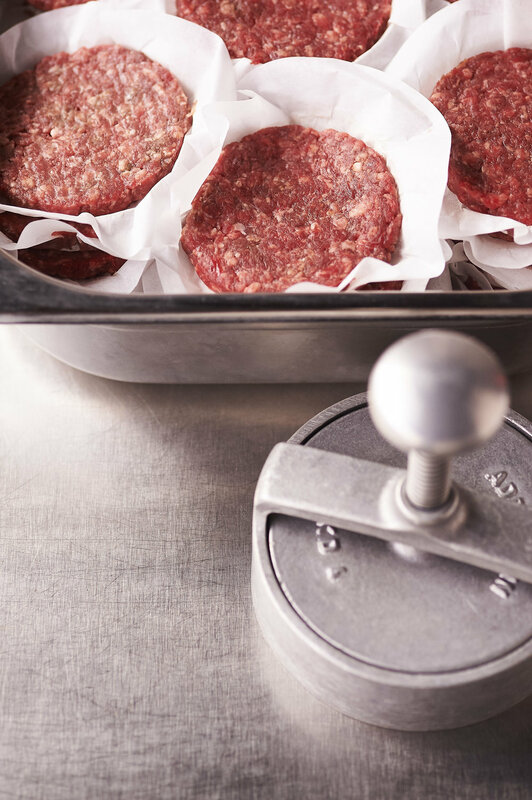 The meat: Our patties are locally sourced 100% locally sourced beef pastured and grass fed, never frozen and containing no fillers or preservatives. We have a very specific, and much-tested ratio of cuts that blend together. Once selected, our beef cuts are freshly ground by our butcher every morning. Every patty is carefully weighed and then pattied into shape by hand for maximum taste. We cook each to perfection at over 240 degrees so the juices flow, and the char is created - these patties get spoiled! Our bacon comes from the family-run Oakley Brothers, who have been using a traditional brick built kiln smoker since 1875. Their tried and trusted methods help produce the finest smoke-infused bacon we have encountered on our search for flavour. The HM!HB! smoke-o-meter always hits a 10 when we unwrap a fresh delivery! We take just as much care with our fries as we do with our burgers. In fact we have sought perfection with our fries feeling let down by many burger joints on our worldwide tasting travels. Hand-cut Maris Piper potatoes (never frozen!) are twice fried with skins on, and then lightly dusted with rosemary salt. Everyone who comes to us wiill see minimum 250KG of potatoes in bags outside the kitchen, we put every potato through our own chipper, one by one. We have competitions to see who can smash a bag the fastest. Our sauces are made from scratch. The HM!HB! Memphis Screamin' Whiskey BBQ Sauce can take up to six hours to get the whiskey and organic molasses to blend correctly. The HM!HB! 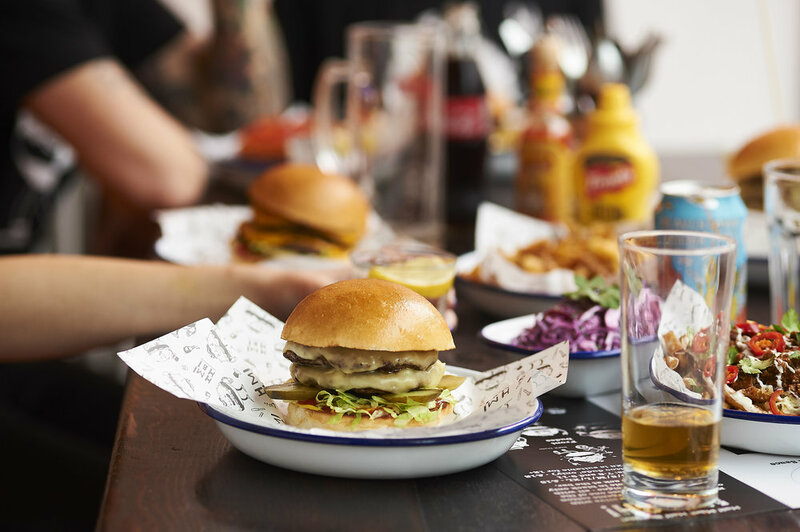 Smoky Bacon & Onion Relish that forms the basis of the super-popular Smokestack, is based on cutting up kilos of very expensive bacon, and utilising liquid smoke, among other secret ingredients in the process of cooking down. 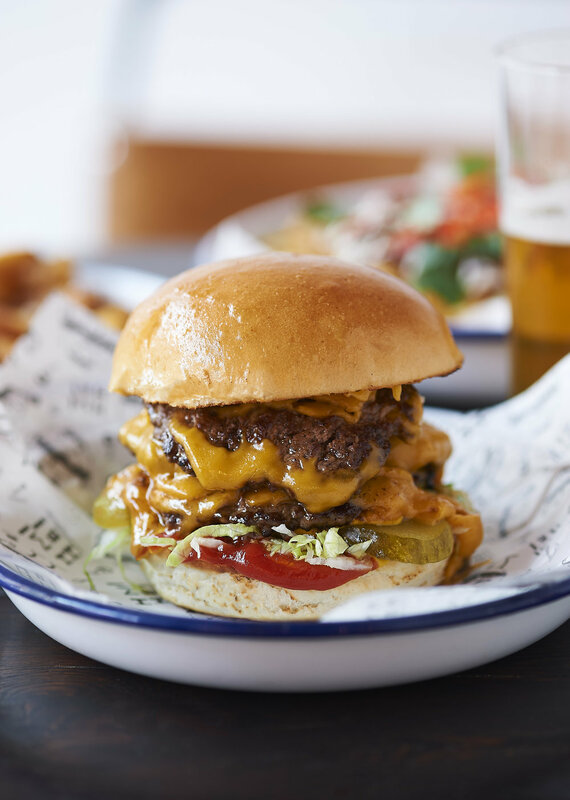 Our 'slaw, our Devil's Fingers, our legendary Chilli Cheese Fries are all lovingly handmade. Nothing processed. Nothing frozen. 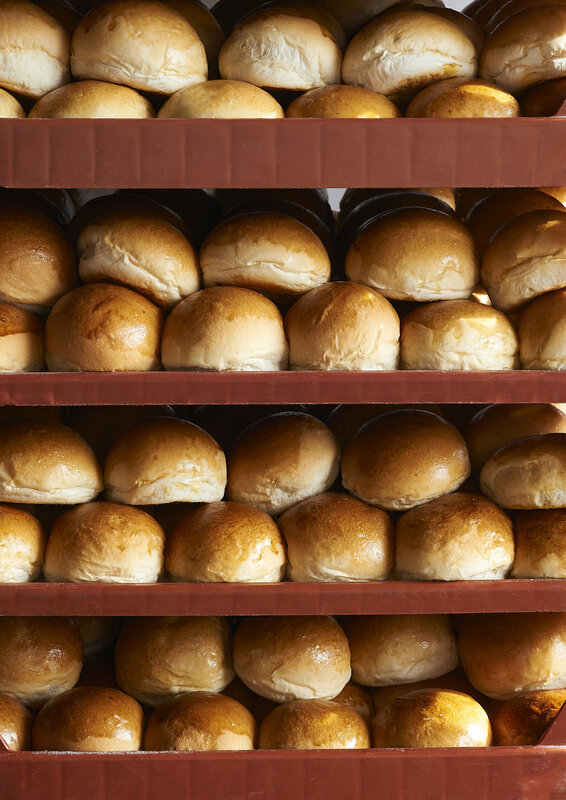 All burgers are served on our own bespoke glazed pain de mie / brioche bun made from Shipton Mill organic flour, and baked locally every day in Sussex for super freshness. Trays arrive each morning and you cannot fake that freshness. We are proud to have had, from day one, incredible vegan bean burgers, all made in our own vegan prep kitchen from scratch, using a huge array of secret ingredients sourced from Infinity Foods & Suma. We built on this by introducing our own Seitan & Jackfruit to huge popularity in January 2019. Vegan buns, vegan cheese fries, vegan mayo, vegan desserts, and now vegan milkshakes complete the scene. Our vegan burgers have attached a huge following and we are proud to have built this up. We have always been about being inclusive. An experience open to all. Fresh desserts, milkshakes / hardshakes, and our own Half Man! Half Brother! beer when only all out total indulgence will do. Freshness in every aspect of preparing food is the single most important factor in our business, There are a lot of burger joints out there, we are trying to raise the bar of what is expected - join us on a mission to preach our brand of freshness as far and wide as we can, one burger at time.